Well I’m still scraping by on drinks to review due to my laziness of doing that thing where you get in the big steel box and direct it to one of those large boxes where people find the different sodas. So today we’re once again relying on my local foodery, a place I’m treating like a dog treats a bone in the yard. Gotta save it for later, don’t finish the bone, gotta save it for later. Today’s scrounging has brought me in contact with Fanta Orange. “Big whoop” you might say and if you did I’d probably chuckle at you. This isn’t your ordinary Fanta Orange, this Fanta Orange hails from Mexico which means… wait for it… yes it’s sweetened with real sugar. I’m pretty sure most of us are vaguely familiar with Fanta, but if not here goes the sentence summary. Fanta is the brand Coke uses for fruit flavors. Heck you might even remember the Fanta Girls asking if you “Wanna Fanta? Don’t you wanna?” If none of that rings your doorbells don’t worry, it’s just orange soda. After using my trusty vintage “Colorado County Federal Savings and Loan Association” bottle opener I’m greeted with the familiar scent of orange soda. It’s not over powering, it’s not amazing, it’s faint and it’s orange. Moving on. Immediately I’m impressed by the light mouth feel this sugar sweetened beverage gives me, but that’s the finish and around here we start from the beginning. Upon first consumption of Fanta Orange my taste buds are greeted with sweet orange flavor. It’s similar to your basic orange candy, but slightly less powerful in taste. The orange essence sits flatly in your mouth for a few seconds before the bubbles set in before coating your tongue with light fizzy bubbles. Throughout the entire experience though there’s the very subtle hint of cardboard. It doesn’t ruin the taste by any means, but it’s most definitely present. Now this “cardboard” taste might only be in my world as I’ve noticed that it’s present in many of the orange sodas I’ve tasted. Frostie, while I like it a lot, is the strongest example of that. With all that said Fanta Orange is still a pretty good orange soda, but nothing you need to seek out. If you’re already a Fan of Fanta (I really hope that’s been an advertising campaign of theirs) then try and find yourself a bottle of the Mexican version. If you’re just “alright” with Orange Fanta then I’d say go ahead and stick to the HFCS version because it’s not worth the extra effort to find this. 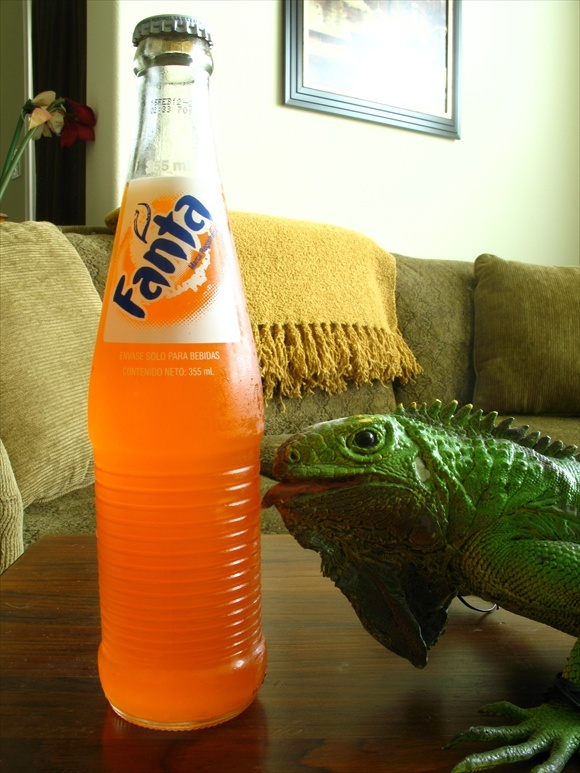 Twist invented soda flavored stamps back in the 70's, but no one wanted to buy from an iguana... pity.